Hardwick Old Hall, the birthplace of the formidable Bess of Hardwick, is situated near Chesterfield in the Peak District National Park. The Old Hall stands in the grounds of Hardwick New Hall which was built later in the 1590s. Although the Old Hall now stands roofless, visitors can still ascend its four floors to view surviving decorative plasterwork, as well as the kitchen and service rooms. An audio tour relates the story of Bess of Hardwick who rose from humble origins to become one of the most powerful people in the court of Queen Elizabeth I. She was married four times, each time gaining more wealth, her fourth husband was the Earl of Shrewsbury, one of the richest and most powerful of the English nobles of the time. At 20, she married a local man, Robert Barley, who died leaving her penniless. But her fortunes were about to change. She caught the eye of Sir William Cavendish, who in 1549 had bought Chatsworth. When he too died young, Bess took a third husband, Sir William St Loe, and by the time of his death in 1565 Bess was a seriously rich woman. For her fourth husband, she aimed high - one of the great 'catches' on the Elizabethan marriage market, the Earl of Shrewsbury. It was a marriage that turned the squire's daughter into a Countess. The Earl was guardian to Mary Queen of Scots and Bess saw her chance to establish a dynasty with a claim to the throne. She set about matchmaking her daughter, Elizabeth Cavendish, with Charles Stuart, the brother of Lord Darnley, Mary's ex-husband. When the Earl found out he was horrified and separated from Bess. On the death of the Earl of Shrewsbury in 1590, who had described Bess as "that sharp bitter shrew", she became Dowager Countess of Shrewsbury. Her granddaughter Arbella Stuart, who Bess had ambitions to one day become Queen of England, spent most of her time with her grandmother at Hardwick. Bess continued with her building projects until her death at the age of eighty which took place at Hardwick Hall in 1608. She was buried at Derby Cathedral where her monument can still be seen. 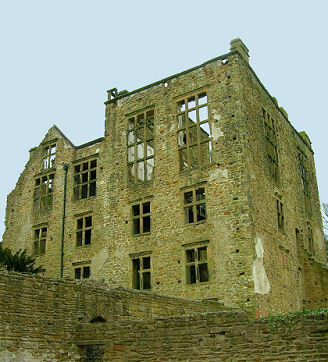 Hardwick Old Hall probably incorporates a manor house begun by James Hardwick (1525-1580), the brother of Bess of Hardwick, to which Bess made radical alterations in the 1580s. Bess did not abandon the Old Hall in favour of her New Hall, which was mostly complete by 1597. She used both and some rooms remained habitable up until as late as the end of the eighteenth century. Gradually though, as no further major building work was carried out, much of the structure deteriorated, became unstable and eventually ruinous. In the 1960s the structure of the Old Hall was consolidated making it possible for the first time for visitors to explore the ruins. Evidence about the early history of the Old Hall is scant but recent examination of the ruins has concluded that its south and west walls predate Bess's campaign of building in the 1580s and may belong to the previous house. A new exhibition in the West Lodge describes Bess's interest in architecture, relating the story of how she transformed her birthplace from a medieval manor house into a luxurious Elizabethan mansion: it operated alongside the New Hall as household accommodation for two centuries. New graphic display panels focus on the rich interiors Bess created. 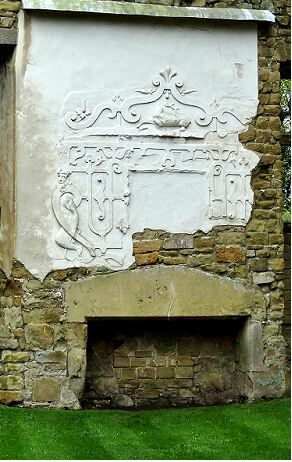 The building is now owned by the National Trust and managed by English Heritage.